Healthy Fit Goddess: Happy Holidays! Time to splurge! Happy Holidays! Time to splurge! Happy Holidays everyone! I'm in Florida now visiting my family for the week. My workplace is closed until January 2nd so I'm excited to get some much-needed rest and time off...I haven't taken a vacation since I started working! My favorite thing about coming to Florida in the winter is the weather and opportunity to be outdoors without freezing. I grew up in Florida so I am definitely a warm-weather type of person, although I also like the change of seasons up north. It was a little cold here when I arrive but it's warming up tomorrow and I'm excited to go for a run with an old friend and then hopefully hit the beach. 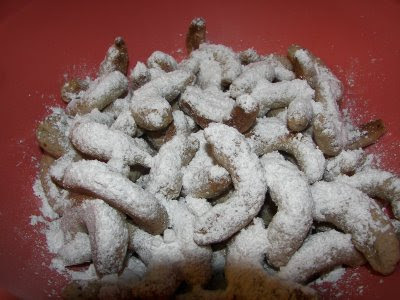 These are traditional Slovak "moon cookies" that my Mom makes for Christmas. What's your favorite holiday treat? At the same time as you tweeted the link to this post, we're making our forth batch of Kolacky! Hope you are having a great holiday vacation. Kolacky are so good! Enjoy your holiday as well! Thrive Forward - launching next week! Raw kale tastes better with a massage!